Uttar Pradesh Subordinate Services Selection Commission aka UPSSSC released a recruitment notification toward UPSSSC Driver Vacancy 2016 inviting all attentive applicants for Driver post. Taking the whole details into consideration, what we see is that 138 vacancies of Driver post are there. And, postulants have to submit online applications from 15th October until the deadline which is considered as 5th November 2016. The applicants have to apply against this recruitment by using the official link (available at the bottom). After the successful completion of application form submission, exam date, admit card, results, etc., will be announced. Therefore, we recommend saving the submitted details for further usage that you had entered during the submission of UPSSSC Driver Jobs Application Form. Since the advertisement is now live, all you need to get it is push the button that you see in the end of this page. By grabbing UPSSSC Driver Notification, you get to know most vital information like age limitations, selection process, application fee, pay scale, etc. Besides it, other crucial facts are to be known by the applying aspirants. While talking about the overall vacancies, the total number of posts we get here is 138. However, these posts have been divided category wise. So, General category has 90 vacancies, OBC has got 19, SC category includes 27 posts and SC has 2 jobs. The applicants who want themselves get employed in the state of Uttar Pradesh (UP) or want to get Driver jobs must apply if they meet the required eligibility criteria. The driver vacancy meant only for those applicants who are under the requisites. Minimum qualification to be part of this Uttar Pradesh Driver Recruitment is 8th standard, however, there are additional qualifications. If you are trying to know when this application form submission was started, let us make it easier for you. The online registration was begun on 15th October and UP Driver Application Form can be submitted until 5th November 2016. Aspirants are required to possess at least 8th Class Certificate from a reputed board/ college to apply for UPSSSC Driver Recruitment 2016. Aspirants should also hold a valid DL (Driving License) not more than 3-year old under DL Rule no. 16. Age Limit: Eligible candidates should be having an age of 21 years to 40 years as on 1st July 2016. Application Fee: To apply online for UPSSSC Driver Recruitment, aspirants might have to pay an application fee. So, download advertisement and check it out. Selection Process: On the basis of Driving and Interview, authority will appoint the aspirants suitable jobs. Pay Scale: A pay scale of Rs. 5200-20200 GP-1900/- will be transferred to those candidates’ accounts that are selected. Use the steps below to easily apply for the UP Driver Vacancies. If you come across any query or suggestion meanwhile, feel free to ask via comments. At first, log on to the official website, viz. upsssc.gov.in. Having been on the homepage, get the Uttar Pradesh Vahan Chalak Advertisement. After that, start doing online registrations – submitting online application forms. Don’t forget to upload required documents and pay the fee. In the end, submit the application form and save one copy for upcoming usage. For more live updates on UPSSSC Driver Vacancy 2016, please keep your eye on this page. For this purpose, you can bookmark (CTRL+D). Did you like this article? If yes, give it a share and help your friends find it useful, too. 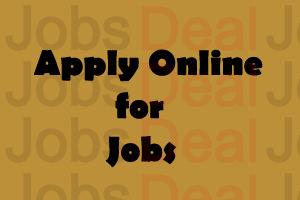 Thanks for visiting Jobsdeal.in!